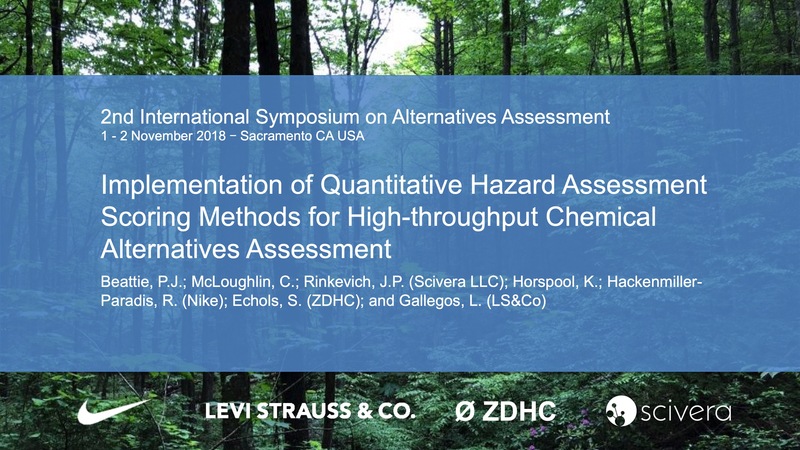 Scivera Founder and President, Joe Rinkevich, presented last week at the 2nd International Symposium on Alternatives Assessment held in Sacramento CA. Joe presented with colleagues Linda Gallegos, Renee Hackenmiller-Paradis, and Scott Echols from Levi Strauss & Co, NIKE, and the ZDHC Programme, respectively. The Symposium, organized by Joel Tickner and his colleagues at the UMass Lowell Center for Sustainable Production, offered an excellent forum for Scivera, Levis, NIKE, and ZDHC to describe ongoing work and collaboration on chemical screening and scoring in the global apparel and footwear supply chain. NIKE, Levis, and several other brands are leading their industry in quantitative chemical screening to expand the use of alternatives assessment toward the selection of safer chemicals in consumer products and processes. The team’s presentation described and showed examples of quantitative chemical screening, Screened Chemistry, NIKE Priority Chemistry, and Scivera Quantitative Chemistry Index, and how this innovative scoring work complements and builds on current frameworks of qualitative chemical screening. Download a copy of the presentation slides here. Scivera and an increasing number of global consumer products brands, along with 100s of factories and chemical suppliers are implementing these quantitative chemical methods via SciveraLENS Rapid Screen. Rapid Screen delivers chemical screening and scoring in a cost-effective and data-backed platform to meet the screening and scoring requirements of global consumer products brands.